Brilliant writing and puzzle design make this first expansion a success, although it's a little familiar in places. What Is It? Expansion to last year's brilliant philosophical puzzler. 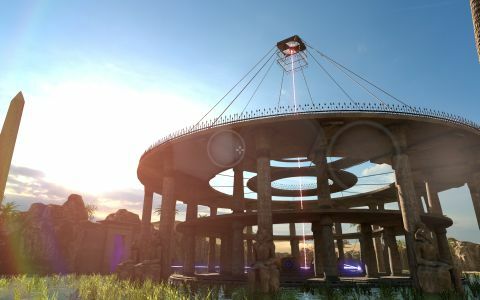 Every puzzle in The Talos Principle is a code waiting to be broken, a cipher rendered as a chamber full of colour-coded lasers, turrets, jammers, mines, fans, pressure plates, and energy barriers. Arriving at a solution means discovering the correct arrangement of all of these elements—no puzzle element is ever superfluous, all of them matter, and somehow, despite the relatively small number of components, each chamber feels substantially different. Entering a new chamber, you're asked to pull together everything you know about the pieces placed before you—the way two lasers counter one another, how blocks can be stacked on roaming drones, and so on—and then derive new interactions. It's a steep mental challenge, continually pushing you up against the borders of your understanding. As a puzzle game, it's a triumphant success. As hard as it is, The Talos Principle is always fair and arriving at a solution feels absolutely extraordinary. All of this is true of The Road to Gehenna too, because this is an expansion of the old-school sort—the type that gives you more of a game you already like. It's a mini-campaign set after the original intended for returning players: this is resolutely not a jumping-on point for newcomers. As such, you're thrown in at the deep end with four new puzzle worlds—completable in any order—that assume you're already familiar with how each puzzle element works. It took me five hours to beat all of the new chambers, although unlocking every secret would take a fair while longer. There are no new puzzle components and each new world mirrors one of the environments from the original game, so on the surface there's not much new here—but the chambers themselves really are excellent, and several rank among my favourite Talos Principle puzzles. Given the nature of this game—and the sort of person who might be intending to play this expansion—it's tricky to go into too many details without spoiling them. Put it this way: that 'eureka!' feeling you've been missing since you finished the base game? Expect at least eighteen more doses of that. The Road to Gehenna's narrative is more focused and less demanding than the base game, although it does assume that you've finished The Talos Principle and come away with a decent grasp of what it all meant. You are Elohim's messenger Uriel, tasked with rescuing AIs trapped in Gehenna, a new part of the simulation. These AI have spent their long imprisonment developing a civilization that looks a lot like an early 90s online bulletin board, complete with community politics and moderator drama. It's funny and clever by turns, rewarding to pick through and affecting in its closing moments. There are lots of nice touches, from the AI's persistent misunderstanding of the small details of human history to the way that Uriel—no matter what you attempt to make him say—tends to slip into the language and manner of the King James Bible. The quality of writing lends Road to Gehenna a sense of import and makes it feel less like a simple map pack. That said, the lack of entirely new elements or environments is a weakness. I didn't feel it as keenly because I last played The Talos Principle six months ago—rediscovering old methods was challenge enough and I wasn't as bothered by the familiarity as I might have been had I only just finished playing the original game. A few more surprises within the puzzles themselves would have made this expansion essential. As it is, it still comes highly recommended. There are very few games this philosophically ambitious, and fewer that match that quality with equally intelligent game design. If you've not experienced it for yourself yet, go and play The Talos Principle. If you have, and you don't feel like your brain has been stretched as far as it can go, then Road to Gehenna is a worthy next step.